The MissNowMrs phones have been ringing with questions regarding the government shut down and how it could affect the married name change process. We’ve compiled everything you need to know regarding the government shut down and how it affects name change forms filed with Social Security, the IRS, the State Department, and your state driver’s license bureau. Social Security cards will still be issued during the government shut down. However, due to a decrease in Social Security Administration personnel it may take longer than the customary 2 weeks for your SS-5 form to be processed and your new Social Security issued. During the government shutdown in 2013 there were delays in the issuance of new Social Security Cards. If you’d like to talk with someone at the Social Security Administration, please call their customer support line at 800.772.1213. The IRS is still accepting and processing the IRS-8822 form that notifies their office of your new name and new address (if applicable.) Again, there may be delays due to fewer personnel in the IRS office but as they do not send you any paperwork after processing your form, don’t stress about it! There’s conflicting information floating around about how the government shut down may affect the issuance of new passports. ABC News reported that passport processing employees will be sent home during the shutdown, causing delays in the 200,000 passport applications currently pending. In a conflicting statement, the State Department has stated that the office will press on and process passport and foreign visas as long as the fees paid for the applications will pay for the processing of paperwork and staff. We’re all for mitigating risk, so if at all possible, book your upcoming travel in your maiden name and wait to apply for your new passport in your new married name until after the government reopens. The offices that issue driver’s licenses are run by the state government, not the federal government, so there will not be any delays or issues. That being said, it’s wise to visit mid-week and mid-day to avoid long office lines. 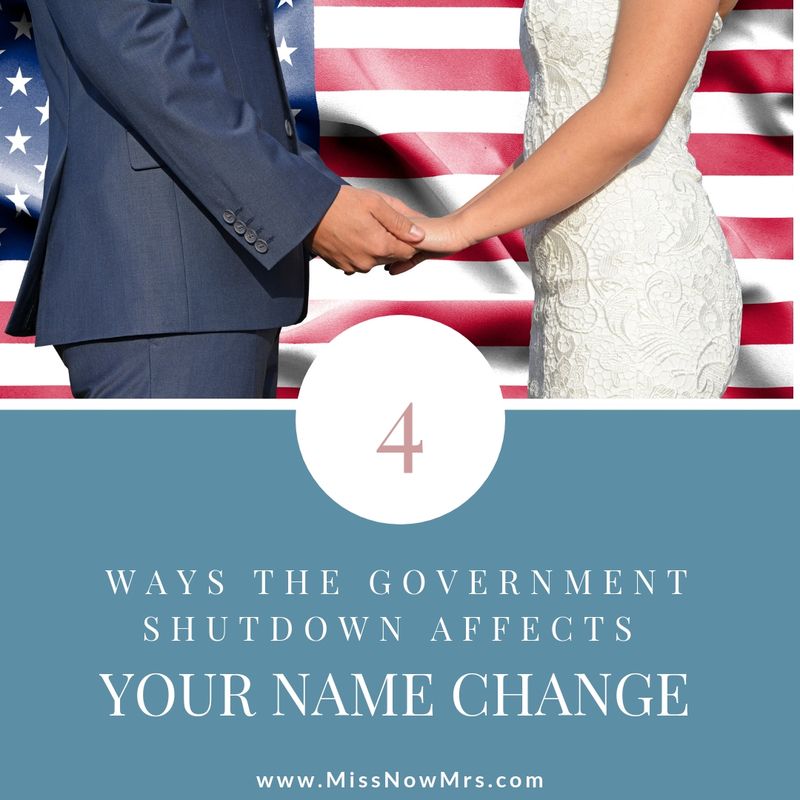 Now that you have the full scoop on how the government shutdown will affect your name change, you can move forward eyes wide open. If you have any questions please feel free to give our name change experts a call!